**This plant closely resembles native cow parsnip but can be distinguished by larger inflorescence size, deep leave dissection and overall plant height. Giant hogweed reproduces by both seed, up to 50,000 per plant, and but fragmented roots. Due to its giant size, it has the potential to form dense canopies that enable it to outcompete and displace native riparian vegetation. The plant produces a watery sap that can cause severe blistering and burning of the skin, impacting human health and negatively impacting environmental resources. In Alaska, there has only been one documented occurrence of giant hogweed in Kake. This infestation site has been successfully eradicated, and continually monitored. 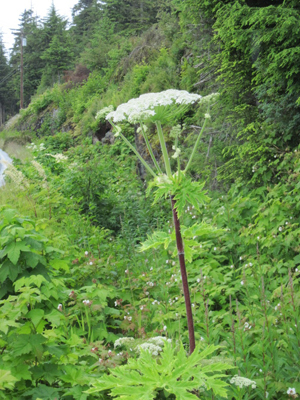 If you think you have seen giant hogweed, report the site by calling 1-877-INVASIV. Manual control must be taken with caution because of the toxic watery sap the giant hogweed produces. Always wear protective equipment when handling this plant. Manually remove by cutting roots at least 3-4 inches below the surface. Mowing repeatedly will also control this plant. Systematic herbicides may also be effective.